There is something radical in making beautiful art in the abandoned parts of our public space, vulnerable not only to the elements but to any art critic or competitive painter. Imagine spending hours on a painting only to find it scrawled on, or painted over by the next muralist, or your medium simply demolished. The galleries of art that line the abandoned buildings and overgrown paths of Humboldt County showcase an authentic American art tradition. The graffiti street art in Humboldt County is distinguished despite the rural surroundings. I think this is because of the influx of newcomers who might study art at a university or bring graffiti experience from larger cities. It is also an area supportive to art and artists, and combined with the allure of a distinguished outlaw tradition, graffiti is a popular means of expression in the area. The outlaw status means that graffiti is illegal. California has one of the most serious penalties for people caught painting — repeat offenders face lengthy prison sentences for graffiti art. Because it is against the law, graffiti artists paint in the middle of the night and craft painting techniques to avoid detection. In part because of the illegality, some of the best representations of the art are exiled to the abandoned periphery where artists can have the time to create cement masterpieces. The graffiti in Humboldt is artistic, political and representative of community arguments. This is an article of critical appreciation — a documentary photo essay intended to present graffiti as influenced by the culture and geography of the North Coast. This essay starts with signature tags which are ubiquitous in most city blocks, examines the evolution to stickers and stencils, considers the dispersal of graffiti methodology via trains, explores the often whimsical art on the slabs of concrete and discusses legal graffiti spots. When talking about tagging people usually want to know why someone would write their nickname a dozen times on the same bathroom wall. I usually point to the ubiquitous repetitive advertising brands which surround most stores, sports arenas, theaters, television programs and fast food spots. Tagging is intentional. It communicates a message (often multiple messages), and is intended to catch our attention. The easiest comparison is advertising. It seems like the saturation approach of tagging graffiti should blend easily with our well-branded lives. But graffiti goes on surfaces not owned by the writer. Marking space without permission is often seen as a crime which violates the "quality of life," threatening property values and scarring public and private spaces. The increase in punishment for graffiti writers has come as a consequence of the moral panic that permeates most public conversations about graffiti. For graffiti artists, the response to threats of incarceration isn't to stop writing but to get faster. Writers practice their signatures until they can create a quick tag or finish a painting with lightning speed. Technologically, the tools for graffiti have evolved to provide writers with the mechanisms they need to go fast. Pressure-sensitive markers with two-inch felt heads (called "On the Run"), super-permanent ink and surgery-precise nozzles for European-made cans of paint with electric colors, all created specifically for graffiti to be presented with maximum efficiency and at maximum speed. But the techniques of the artists also mutated to match police and storefront surveillance. Instead of better, the street-driven nature of graffiti competition changed to be about more. More tags, larger paintings and icons placed in the most visible spots. Because writers are punished only if they are caught writing, they are anxious to be able to make as large of a mark as quickly and quietly as possible. In terms of tagging, the result is a proliferation of a single name or slogan to make it harder to clean up and easier to avoid detection. The tag is a punch line, a notation whose purpose is clear in its disingenuous nature — childlike yet carefully practiced, clearly crafted from letters yet written in a way that not everyone can read, positioned deep in the bowels of the urban environment. Tags take up space. They mark geography as somewhere that the writer goes, and also transform the visual landscape into a personal advertising medium. 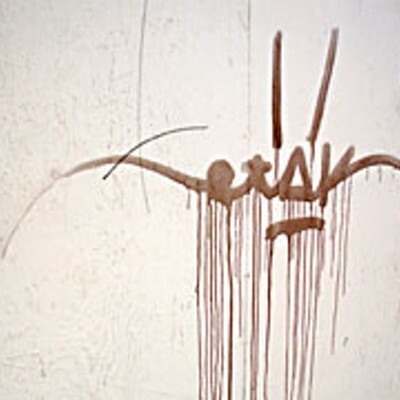 Tagging has been the heart of graffiti for years — the inter-generational lingua franca of deviants. Cities like New York City, Philadelphia, San Francisco and Los Angeles all have unique and distinct hand styles — variants on ways of writing your name. Despite the perception of illegibility, there are well-understood aesthetic standards for tags. As models for hand styles emerged, a loose set of ethical rules also developed. Included in the afterword of Shawn Powers' book The Art of Getting Over is an actual set of rules for aspiring graffiti writers. 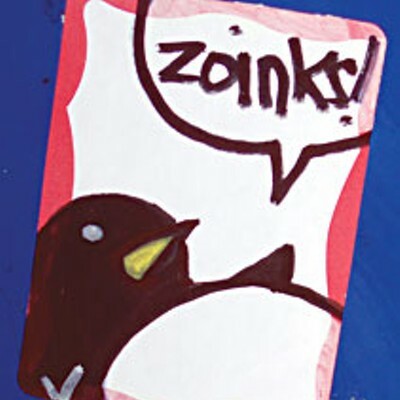 (Powers is also known as the genre-bending street artist ESPO). Number five includes: "Don't write on houses of worship, people's houses in general, other writer's names and tombstones. Writing on memorial walls and cars is beef beyond belief." 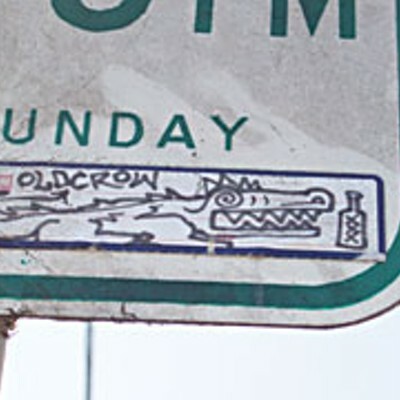 Despite the outlaw legacy, many writers follow street rules when they paint. Within Shawn Powers' prohibitions, writers are encouraged to use their imagination by an art tradition that has rewarded artists for discovering new places and ways to mark. The result is more often creative than vandalism. But regardless of creativity, the tag is illegal. Tagging is probably the most despised part of graffiti. It certainly gains the anger and frustration of hundreds of North Coast property owners every year, not to mention the ire of workers who have to clean up graffiti. My friends Scott and Laura dealt with the very real frustration of having their garage repeatedly scrawled on by a local tagger. Knowing that I had an interest in graffiti, Scott wanted to express his very real frustration at having to paint his garage three times. He was out the money, and also angry that he couldn't even read the tag. I can sympathize with people like Laura and Scott. It is frustrating to have to see messages that you don't want to see, and of course if it is your property that has been marked with graffiti you are likely to be out money and time to clean it up. When I chose images for this essay I purposefully chose not to include anything by the writer who marked Scott and Laura's garage. If graffiti writers put up their marks for fame (notoriety) they probably are trying to say something about that space. Ignoring, criticizing and/or covering over those images communicate a response. It is obvious that the heavy hands of law-enforcement haven't stopped or even slowed graffiti. Despite enormous resources that are poured into catching and covering graffiti, writers seem to evolve around the constraints. The catch-22 is that many graffiti artists justify themselves precisely on the same dynamics that made the art so infuriating to homeowners. Writers argue that because every inch of space is bought up and controlled, any public artistic expression is necessarily illegal. The fact that writers can get arrested for writing on someone's garage proves to writers that the system is out of whack, and simultaneously enshrines tagging as rebellious street art. It is easy to create a dualism in graffiti that says that one kind is good and another kind is bad. It is almost all illegal, and these distinctions usually couch aesthetic opinions in arguments about placement and legality. The tag has evolved to become a visual representation of high-speed communication that is relevant to understand the spaces of the North Coast. You don't have to like the marks to recognize that they are significant to the people who make them. The need to express complex imagery and mark territory in a quick manner has resulted in two significant artistic changes in street art: stickers and stencils. Graffiti writers inscribe stickers with images and slogans and place them at their leisure. Stencils are cut out of cardboard and are used to create a highly detailed imaged that can be applied and even repeated in seconds. Both technologies allow artists to reach spaces that they wouldn't otherwise be able to mark. Stop signs, walls, mailboxes, and phone booths (such as they exist, anymore) can be slapped with a sticker in seconds, even in the midst of a busy street. Stencils allow artists to create complex images and dense messages. 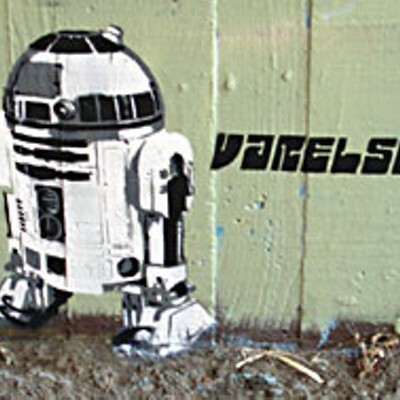 With the help of a couple of layers of paint and stencils, artists can make compelling three-dimensional art on local walls, such as the work by VARELSE who offers crisp renditions of a rat, R2D2 and Bill Gates via the stencil medium. Stencil graffiti has a long political tradition and borrows as much from anarchist punk rock culture as hip hop. 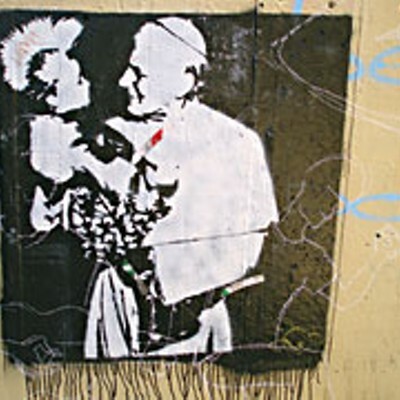 One of the critical functions of the stencil is juxtaposition, where distinct images can be layered against each other, such as this example of the pope embracing a young child with a Mohawk. Stencils and stickers are the reality of a political economy that makes painting on the street risky. They are responses to surveillance and technological extensions of peoples' desire to alter their environments. It is in Humboldt, where political dogma and art mesh, that the stencil community really seems to produce some sublime imagery. Graffiti in North America has evolved along train tracks, in large part because the trains carried graffiti images and monikers across a city — personalized moving billboards. But the train yards where people painted were also relatively safe places to create bigger and more colorful pieces than the next painter. 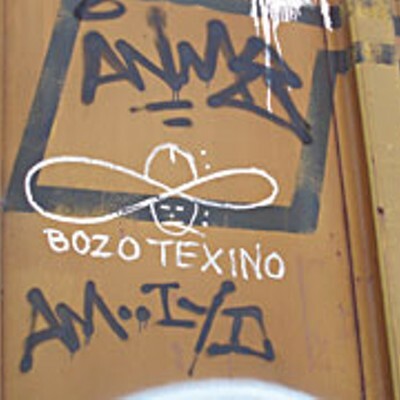 It is among train graffiti that most stylistic evolution emerged. Freight train painting spread the art format nationwide and displaced the artistic center from urban areas to anywhere trains stopped. Graffiti art, no matter how deeply embedded in the space of cities, found appreciation in the rural spaces of North America and expression via a growing web of inscribed freight trains. 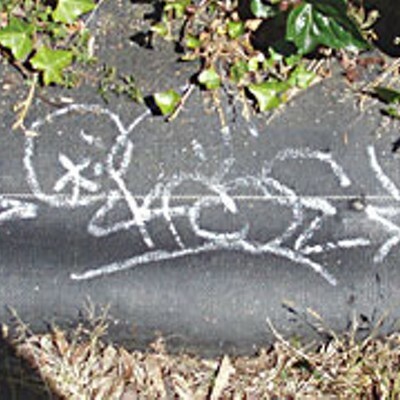 The marks of wildstyle graffiti joined the decades-older marks of freight workers and hobos. Humboldt doesn't have a working railway anymore, but abandoned trains litter the tracks of this area, and artists here are still heavily invested in the credibility that comes with painting trains, even if they haven't run in decades. Climb through the barbed wire and blackberry bushes near any of the abandoned trains in the area and you'll be likely to see some paint. As artists competed on railways, the actual form of graffiti changed. Founded on the letters, the evolutions of form that made the "masterpiece" — color, three dimensions, fill, arrows, lines, shading — twisted to become more and more extreme. These new iterations came from the innovations made by singular artists and crews who were going over each other with bigger and better pieces, developing art by showing what could be done. One stylistic change has been the development of the throw up, a painting that is tersely abbreviated in content, comprising one or two colors and created to cover large spaces. Usually the preferred technique for painting on surfaces like a bumpy storefront or railway car, in Humboldt it is both the training wheels for aspiring painters and a way to inscribe hard-to-paint nooks and crannies. Saint Louis/Los Angeles Graffiti writer GUER described his aesthetic standards in an interview with freight magazine All1Nation: "A good piece has a nice flow to it, good spacing, graceful curves, good use of negative space, good contrast of color, colors that don't clash, colors that are not too busy that drown out the letters ..."
Trains are a nexus of tradition: both mediums of communication and rolling canvasses. The remnants of train transportation still serve as inspiration for Humboldt artists. Many artists reserve their strongest three-dimensional pieces for trains and they stand as collective galleries of steel art. Industrial capitalism regularly discards concrete, and on the North Coast bits of concrete walls and foundations of long-abandoned businesses are commonplace. It is on the outskirts of public space that graffiti artists can find the time and space to paint and hone their method of expression. It doesn't hurt that the mythology of the solitary painter sneaking through the train yard in the middle of the night transfers easily to Humboldt's underpasses and backwoods spots. For those artists, their work has been exiled to the periphery — found on shattered chunks of concrete often deep in the Humboldt woods. The lure of Humboldt life has attracted some famous painters to leave their marks on our local walls — some coming for school, some coming to immerse in the ganja trade, others just visiting. Whatever drew artists here, they have meshed with homegrown artists, nursed on Internet sites, gassed up on backwoods painting sessions and created some brilliant work in places where most people will never see them. Behind the Redwood Curtain, the art is quite often surreal. In part a mash-up of a variety of influences, the art on the abandoned walls is absolutely strange and sometimes whimsical. 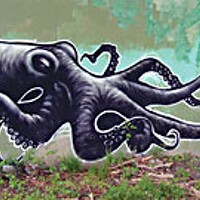 Some artist or artists express themselves with a giant octopus or with bizarre images of cities. Others paint flowers and cover the tough-guy imagery of graffiti with a Sesame Street motif of bright paint and images well outside of the graffiti canon. Among the abandoned walls of our rural county, artists paint on almost anything they can find. A discarded television resting near a graffiti site is marked with dozens of tags. Cement outcroppings that are barely high enough for someone to stumble upon get covered with three-dimensional paintings. As artists create, time erases what they put up. Paintings get covered by fast-growing bushes and during the rainy season, dry pits become swamps filled with treacherous looking gray water. The elements are particularly harsh on spray paint and the images once brilliant with contrast fade surprisingly fast. The apocalyptic former industrial spaces of the backwoods offer enough blank walls for people to rebel against the one-dimensional expectations of form. The Humboldt writers will paint on anything and often produce creative and unexpected work in the area's badlands. The writing is on the wall for most graffiti artists: Stop painting. Because of stiff criminal penalties, many of the most talented artists choose to paint only legal walls — spots with the complete permission of the property holders. There are a number of local businesses with murals painted on their walls. Downtown Eureka in particular has a number of multi-story murals, many by local muralists. A few local spots offer up their walls for graffiti-style artists. Among the most committed are the Wallstars, who have been creating rotating art on the side of a wall at the Arcata Recycling Center and a few other businesses for long enough to have put up dozens of different art pieces. The ability to write in broad daylight, to be able to correct your work and take your time with a painting, often enables artists to really shine. 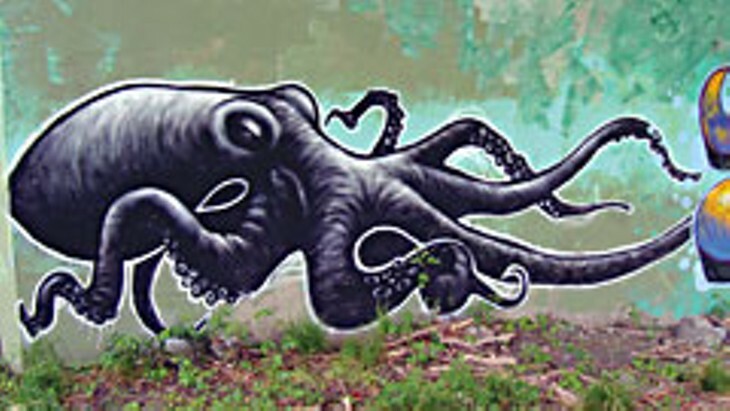 The style and techniques that were honed via illegal graffiti contribute to the legal-wall development, but knowing that the piece is welcome means that the artists will often find ideas and concepts for their paintings that relate to the audience. There are a few purists who believe that it isn't graffiti if you got permission to write it. This seems like a particularly limiting perspective that maintains outlaw credibility at the cost of diversity of expression. Even more limiting was the Eureka resident who objected to a painting on the side of a Eureka saloon because it was "not appropriate for Old Town." The mural was created by the Ink People for the Arts-sponsored program United Future, but when the legal mural crew didn't have the correct zoning it was painted over — despite having gotten permission from the business owner. Legal walls are spaces that allow street artists to express themselves without earning the wrath that comes with midnight street painting, in essence balancing community desires with expression. But it is often the community's first introduction to full-color explosive giant art murals and often, as in Eureka, the expression is something different than people expect. On the other hand, the Eureka Co-Op and the Arkley Center for the Performing Arts are covered with gigantic murals, and it is hard to imagine a community member drawing a delineation between the 20-foot Louis Armstrong and the painting behind the Eureka saloon, other than the style of the art. The space to collaborate on a legal wall provides the chance for new ideas and inventive themes to be articulated — precisely the kind of thing that might help endear graffiti art to members of the community. The recycling wall in Arcata has been marked with statements on political hypocrisy, football throw-downs, imagery of ancient Egypt and Captain Crunch asking us if we know how much CO2 we produce. Legal walls offer a means to share graffiti art on the terms of business owners. Refined street art, legal walls often stand as the only places unmarked with graffiti because local writers see the spaces as worthy of respect. If graffiti writing is inevitable, and yet most graffiti writers exhibit community norms, such as respecting legal walls and memorial walls, perhaps a semi-legal relationship where writing is encouraged in some places can help bring the power of street art into visibility for a broader audience. Coming from the subway tradition, art critics who appreciate graffiti are often called "benchers," so named because writers and fans would gather on certain subway benches to photograph, view and criticize subway art as it rolled past. Ironically, Humboldt County benching means walking through graffiti spots to see if there is new art. In the universe of graffiti writers, a central rule is that you can only go over someone else's art if yours is better — and in some locations, the hyper-competitive nature of graffiti means artists are blasting over each other with monthly regularity, resulting in a laboratory of creativity. Despite walking around and appreciating the graffiti and street art in Humboldt for the last couple of years, I haven't really met very many artists. It is awkward, since I don't actually write; all I can do is gush over what they can do. More than a year ago someone introduced me to a local writer at Humboldt Brews. After I casually explained that I was a professor who liked graffiti, the writer simply turned around and walked away. The fame of graffiti is often compared to that of superheroes who want to be well known and simultaneously want absolute anonymity. Given the serious penalties for graffiti this desire for protection makes a lot of sense. So despite my hours walking around looking for graffiti on the coast, near rail tracks, under highway overpasses and along the backwoods paths, I have only met a handful of graffiti artists, and almost all of them through the legal walls where they proudly put their names. I'm aware that people who write graffiti will view what I've written about their art form with frustration. I acknowledge my ignorance and lack of participation within the art form. My photos and generalizations aren't truly representative of much more than the last two years of Humboldt graffiti and there are a number of dynamics that aren't covered in this photo essay. But I think that graffiti is important, and despite its reputation it is terribly temporary art. It is vulnerable to destruction, and if it isn't documented it will quickly disappear. Documentation has another benefit, which is that it encourages dialog about that art. It is obvious that some graffiti is better than other graffiti, and I think that the aesthetic preferences are worthy of discussion. I started taking pictures of graffiti so that I could take them home and try to figure out what they said. Within a few months I realized that I could compare the images unfolding and see skill developing in certain artists. I also started noticing graffiti everywhere, a kind of secret language of the streets. It took a little while for me to understand what some images said, but comprehension came with the appreciation for the often clever design work of graffiti artists. I also started to see the amount of work that went into making graffiti. It was an entirely different language, and one that required its own homemade Berlitz course. It requires curiosity and trust to discuss such incredible art, with the awareness that the only reason it is so amazing is because it emerged unregulated and unconstrained. It isn't surprising that the biggest and brightest murals in Humboldt County are buried behind thick bushes and attached to rickety abandoned walls. Under the pressure of illegality, the images, application and placement of graffiti have mutated to fit the streets and mossy overgrown cement of this place.